This is the first time I’ve entered NaNoWriMo (National Novel Writing Month). For those of you who don’t know, it’s an American idea that’s spread around the world. The idea is to write 50,000 words of a novel in one month. 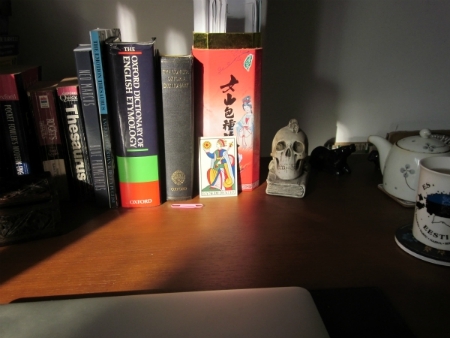 My writing desk with tea, dictionaries, skull, and other writing essentials. 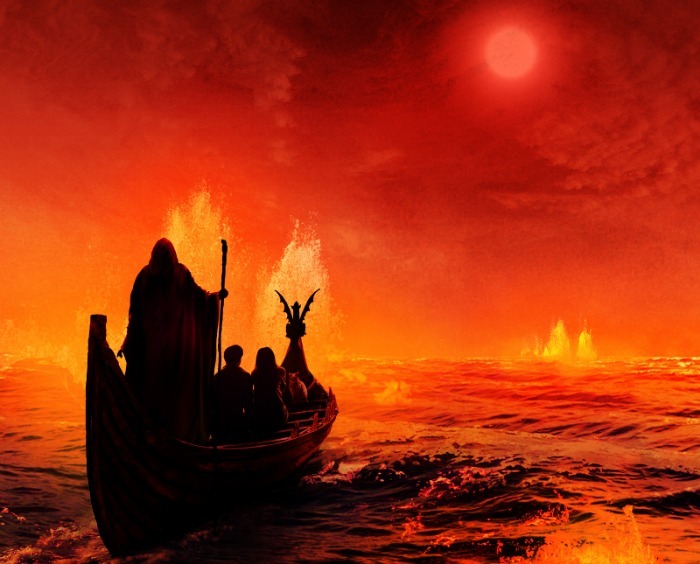 My writing goals in November 2018 were to begin writing the first draft of the third in my Blue Prometheus trilogy (Fire Rising), for which I’d already written a partial outline; to write a short story based on a ship picture prompt on Fantasy Faction (The Arks of Green—based on picture two), and to complete various nonfiction writing projects. Already too much, but my plans were made before I thought about NaNoWriMo, I and didn’t want to change them. I suspected I might fail in this and did, but I gained something, too. I learnt that I’m a fairly slow writer, but not the slowest I know. I write about 500 words an hour and can comfortably write about 1,000-1,500 a day, before I’m forced to do other things. I learnt that having a detailed outline is important for me. My outline was incomplete, and not as detailed as I’d imagined it was. For the parts of the novel where my outline was detailed, my output doubled. A strong hint of how I should prepare for my next book. I learnt how I need to improve my outlines. Before, they detailed the main points, but I need to go into more detail on every character in the scene (including their names, appearance, and motivations), and I need to detail more precisely how they get out of the fixes they’re in. I’ve also learnt that I enjoy doing more than one thing at a time, and being able to write a short story and nonfiction as well, was a relief from always focussing on the same story (which I’m enjoying, by the way). I wrote just over 23,000 words of Fire Rising. So, if it’s anything typical, I’ve written just over a quarter of the novel. It’s the cleanest first draft I’ve written so far, and I’m pleased with the story—but faster would have been nice. I’ve also written the first draft of a short story. My working title is The Arks of Green. This is set in the far future of my imagined world. I wrote it by hand, but my best guess is that it’s about 3,000-4,000 words long. Too long for the Fantasy Faction contest I’d hoped to enter. But I like the story and just need to edit it. I wrote more nonfiction: some articles for this website, and several articles for a new project that I’ll reveal at the end of the year. Something completely separate from my fantasy. Of course, for me, NaNoWriMo was simply a tool to try to motivate myself to write more, and despite not achieving the NaNoWriMo goal of 50,000 words, I’ve made a start, and will continue until I’ve finished. The deeper I’ve got into the novel, the more excited I’ve become with the story, so hopefully I’ll pick up speed. Certainly, I won’t stop.